I hope you weren’t expecting the usual 1000 words about Nutella vs candy bar nougat today. I’m afraid that’ll have to wait until next week or something. I’m all worded out at the moment. Well, okay, not really. But I figured I’d go easy on you for once. First, the response from my request for “beta” readers on Monday was much bigger that I’d expected. I figured that, at best, Mom would sign up and then I’d have to gently tell her that while she can absolutely read the book, I don’t think she’s really, you know, objective. Well, I received a lot more requests than that, and oddly enough, Mom didn’t offer, admitting she already knew she was biased. In the end, I actually got too many volunteers. I’m going to have to draw names out of a hat or something. I know, it’s crazy. So, if you offered to read it for me and end up one of the lucky names from the hockey helmet (it’s what I got), I’ll be in touch closer to when my revisions pass is complete. Thank you, so much, everyone for believing that the words I’ve strung together are worth risking your time on. Second, I’ve had a few minutes here and there to think about other things this week, which led me to thoughts of beer. What? Hey, at least I’m consistent. At any rate, it occurred to me that I’ve been basically ignoring an entire branch of brewing tradition; I have little experience with Belgian beers. Why is that, you ask? What am I going to do about it? Well, now that you mention it, I’ve written a nice post over at Hoperatives about that very subject. Here’s a little teaser: I made a reference to my “big boy pants”. You know you want to read it now. 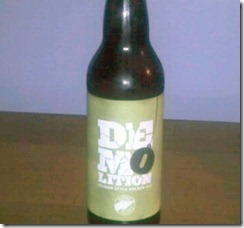 Finally, later tonight, after the obligatory spin on the exercise bike, I’m going to drink this beer and watch a DVD. Because it’s Thursday, and that’s what I want to do. So, who’s got bigger plans than me? ‹ PreviousRemember when comedies were funny?